FILE - In this April 11, 2017 file photo, Defense Secretary Jim Mattis pauses during a news conference at the Pentagon. 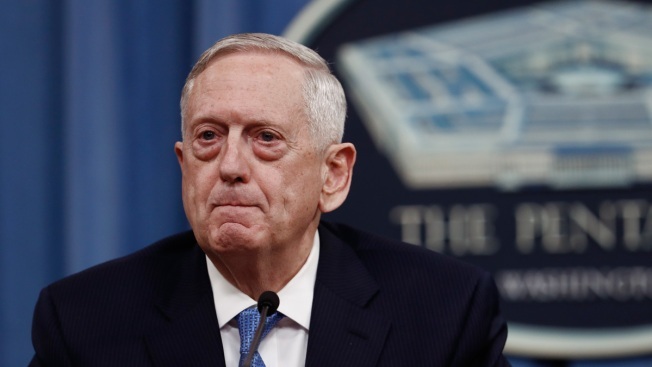 It will be a "bumpy road" to the nuclear negotiations with North Korea later this month, Defense Secretary Jim Mattis warned Sunday, telling his South Korean and Japanese counterparts they must maintain a strong defensive stance so the diplomats can negotiate from a position of strength. Mattis was speaking at the start of a meeting with South Korean Defense Minister Song Young-moo and Japanese Defense Minister Itsunori Onodera on the final day of the Shangri-La Dialogue security conference. He said allies must remain vigilant. "We can anticipate, at best, a bumpy road to the negotiations," Mattis said. "In this moment we are steadfastly committed to strengthening even further our defense cooperation as the best means for preserving the peace." Plans are moving forward for a nuclear weapons summit between President Donald Trump and North Korean leader Kim Jong Un on June 12 in Singapore. And Mattis repeated the U.S. position that North Korea will only receive relief from U.N. national security sanctions when it demonstrates "verifiable and irreversible steps" to denuclearization. Through an interpreter, Song said that this is a great turning point as North Korea takes its first steps toward denuclearization. "Of course, given North Korea's past, we must be cautious in approaching this," he added that some of North Korea's recent measures "give us reasons to be positive and one can be cautiously optimistic as we move forward."